Interview with Simon Norfolk by Unseen Amsterdam. “This year Unseen Amsterdam will be collaborating with Project Pressure to present When Records Melt, an exhibition dedicated to raising environmental awareness through photography. To truly get to the bottom of all that lies at the heart of the exhibition and the charity as a whole, we spoke to photographer Simon Norfolk, who worked recently alongside founder and director Klaus Thymann on a new collabrative project and the most recent commission created in collaboration with Project Pressure. Can you tell us more about the new project Shroud you are working on with Klaus Thymann? 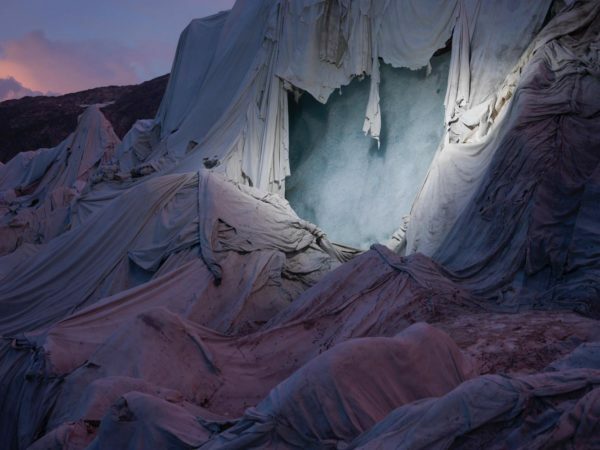 I’ve always found being in the presence of a glacier most haunting. Silent, withering, accusing. I’m 55 years old: my generation’s lifestyle burned away this ice. On a glacier I always feel in some sense, guilty.